Saw this Friday driving home from work just outside Racine. I was getting closer and for the life of me could not figure out what it was. 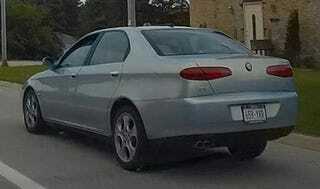 Finally I started thinking, “That can’t be an Alfa, can it?” He turned off and I spotted the badge, and sure enough. I’m pretty curious as to how it is here.